Dr. Bruce Banner is the Green Goliath... actually, the Gray Goliath! What?! Join Tommy & Mike D. for the first Jacked Kirby episode of 2019, wherein they discuss the first six issues of Marvel Comic’s The Incredible Hulk (1962)... before some major changes occurred. As usual big shout outs to our super producer Rob Martin for making the podcast sound unbelievable and getting the show post week in and week out!!!! Need to say: I totally agree with Tommy. The best scene from the Ang Lee Hulk movie is the desert scene. In fact, maybe the only good thing about this production besides Jennifer Connely. 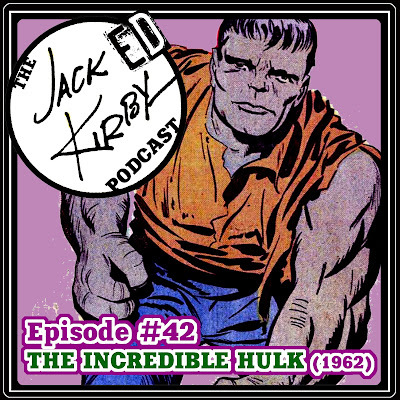 I think Todd McFarlane and John Byrne did good versions of Hulk because they reference Kirby disigns of the Character. In the own King's work I thing the first Hulk design were more monstruous.